Graduate Studies Week featured a new competition, 3-Minute Faculty, where faculty members had three minutes and just one PowerPoint slide to explain their research in language accessible to a general audience. Holding the winner’s check for $500 in travel support is Susan Wright, School of Business faculty member in accounting, finance and law, who earned the top app-based vote total among audience members for “Blending ‘Old-Tech’ with ‘New-Tech’ to Document Online Learning.” Other competitors (from left) were Yi Liu of accounting, finance and law; Kristin Sotak of management and marketing; Jessica Maureen Harris of health promotion and wellness; Steven Abraham (partially hidden) of human resources management; Michele Thornton of management and marketing; Marybeth Longo of communication studies; Stathis Kefallonitis of management and marketing; Damian Schofield of human-computer interaction; Yavuz Keceli of the School of Business; and Cara Thompson of art. 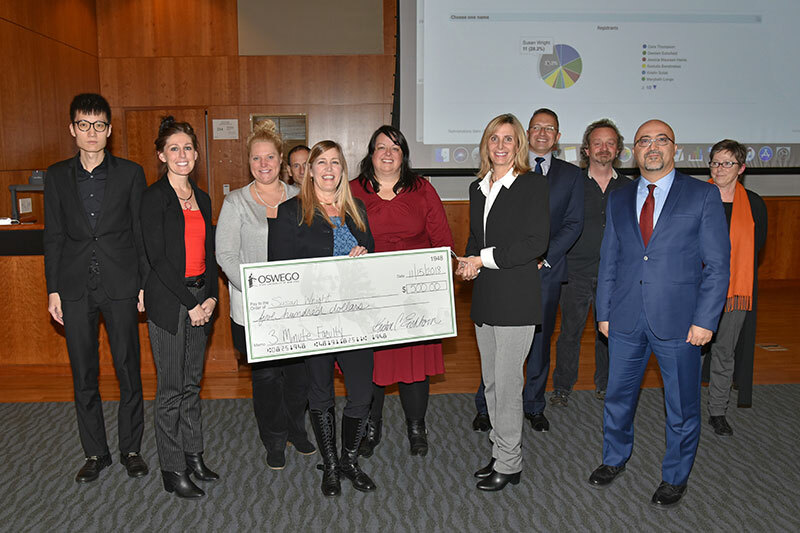 Modeled on the University of Queensland’s 3-Minute Thesis competition for students, which debuted at SUNY Oswego during Quest 2018, 3-Minute Faculty took place on Nov. 15. Faculty representing just a few of the many departments and programs in the Graduate Studies Showcase include (from left) Daniel McManus of counseling and psychological services, Karen Wolford of psychology, Jason Duffy of mental health counseling and Jodi Mullen of counseling and psychological services. Informational tables displayed research and other opportunities that have evolved in 70 years of graduate education at the college. The Nov. 16 event during Graduate Studies Week also featured live music, wine, cheese and desserts. The Graduate Studies Showcase in Sheldon Hall ballroom Nov. 16 celebrates 70 years of graduate education at SUNY Oswego. 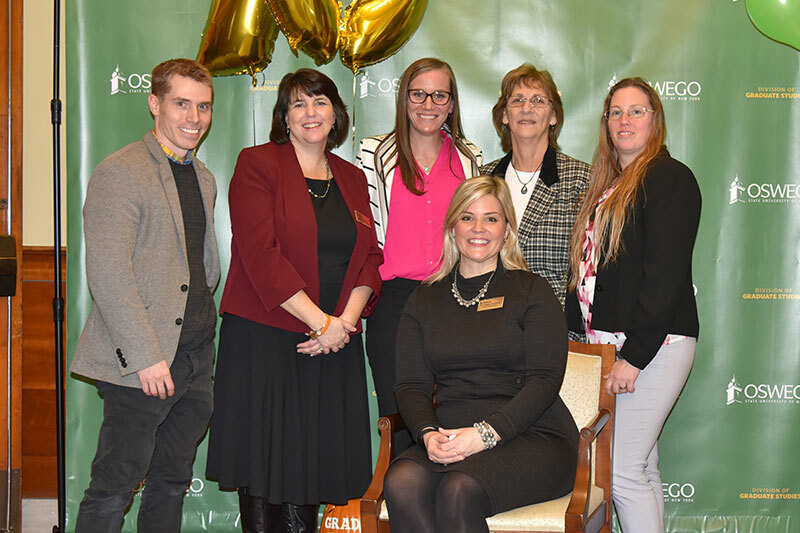 Graduate Studies Dean Kristen Eichhorn (seated) gathers with staff members (from left) Zachary DeMarsh, Sharon Griffin, Laura Spenceley, Gale Law-Folds and Shana Vandish. Outstanding Graduate Student Awards and Outstanding Faculty Teaching Awards were announced at the event. 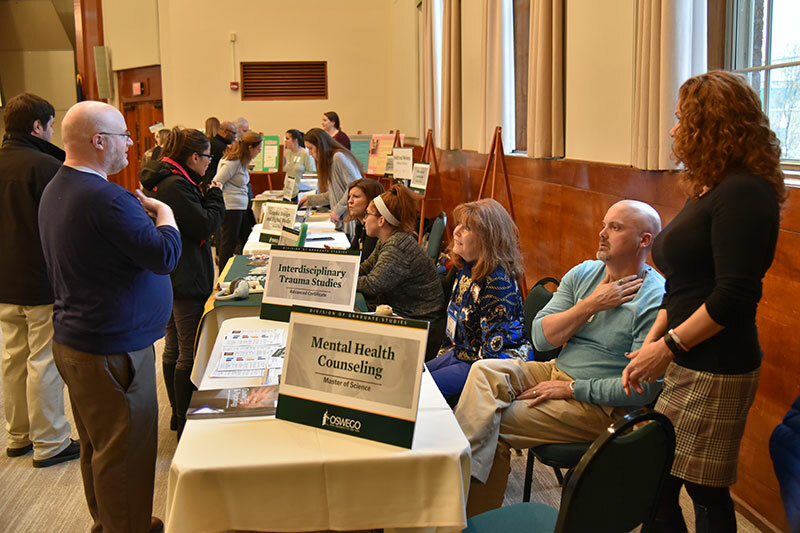 The Graduate Studies Showcase gave departments and programs across campus the opportunity to promote their contributions to graduate education at the college. 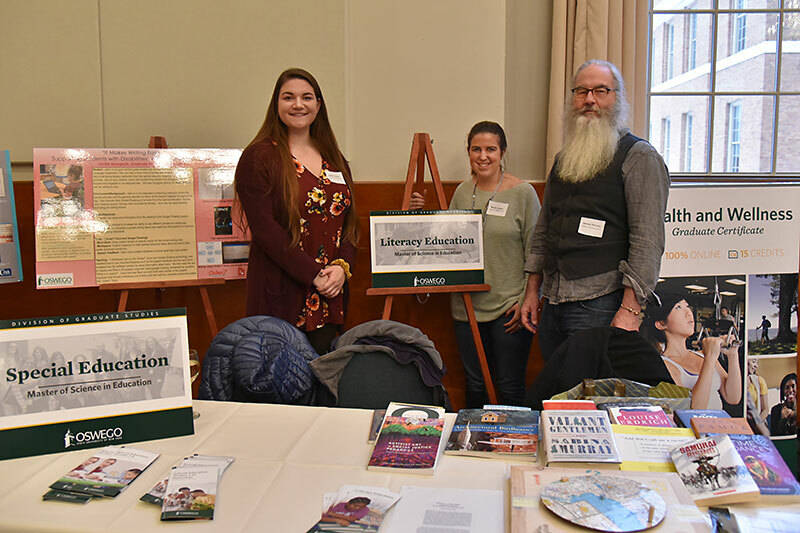 Representing the literacy education program, which leads to a master of science in education degree, are (from left) graduate students Emily Casazza and Nicole Leader, and faculty member Dennis Parsons. 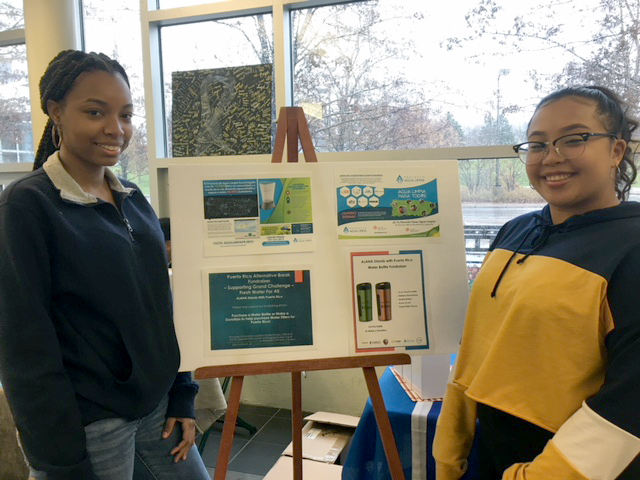 Students Kyara Carter (left) and Mikayla Rebuquiao are among the students and staff in collaboration with ALANA and the Community Services office raising funds to support the Grand Challenge: Fresh Water For All initiative. To raise money, they are selling heavy-duty water bottles for $10 apiece online and from a table every Wednesday on the Marano Campus Center concourse. As part of the Puerto Rico Alternative Break Winter 2019 program, a group will travel to Puerto Rico and work with Proyecto Agua Limpia to purchase and distribute Kohler water filters/cartridges to families in need of water filtration that were affected by the hurricanes in 2017. Carter is one of the students traveling to Puerto Rico, while Rebuquiao is an ALANA student leader who applied for the Grand Challenge Fresh Water for All grant and researched the project. 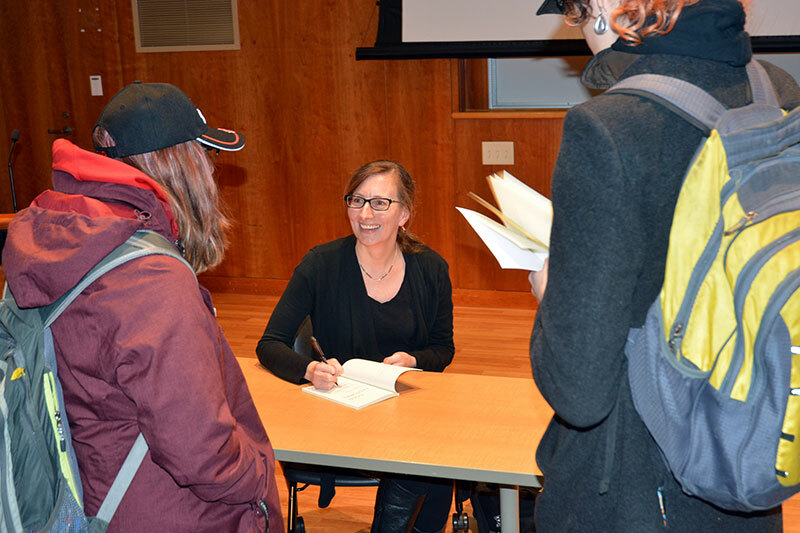 Poet Rebecca Dunham signs copies of her collection “Cold Pastoral” for students in Laura Donnelly’s Living Writers class following Dunham’s presentation in Marano Campus Center auditorium. Dunham has conducted research and produced poetry at the intersection of nature and humankind in such disasters as the Deepwater Horizon blowout, Hurricane Katrina and the Flint water crisis. Her work and appearance for Living Writers dovetails with SUNY Oswego’s Grand Challenges Project: Fresh Water for All. Baskets of Caring attract the votes of students (from left) Nicole Smith, a junior finance major; Iyana Armstrong, freshman finance major; and Haley Sellers, freshman childhood education major, along Marano Campus Center concourse on Nov. 15. 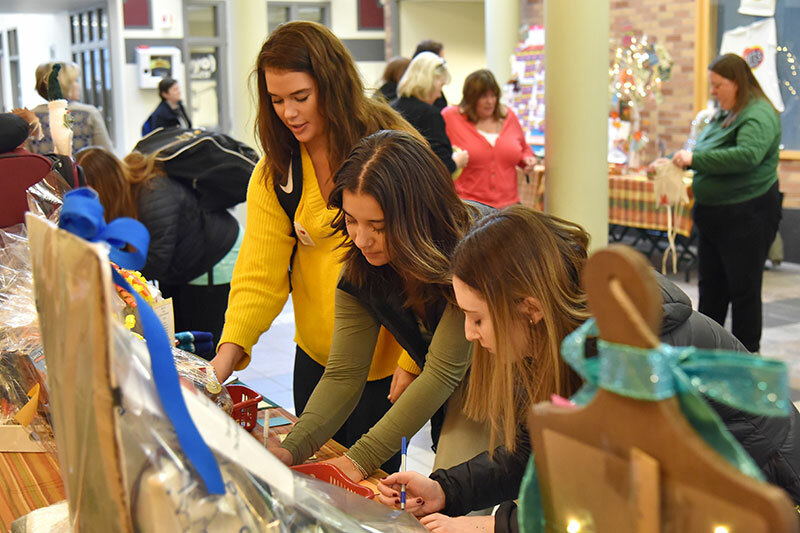 A popular annual event of the State Employees Federated Appeal, the 17 Baskets of Caring provided by donors in offices and buildings across campus raised $4,365 in $1 votes over two days. Winning baskets included: in first place, "What's Your Dream?" donated by the Office of Alumni and Parent Relations, with 624 tickets; second place, "The Money Tree" by Marano Campus Center, 549 tickets; and in third, "Wonderland of Riches" by Rich Hall, 541 tickets. For a list of faculty, staff and student winners of drawings for each basket, visit the SEFA site. 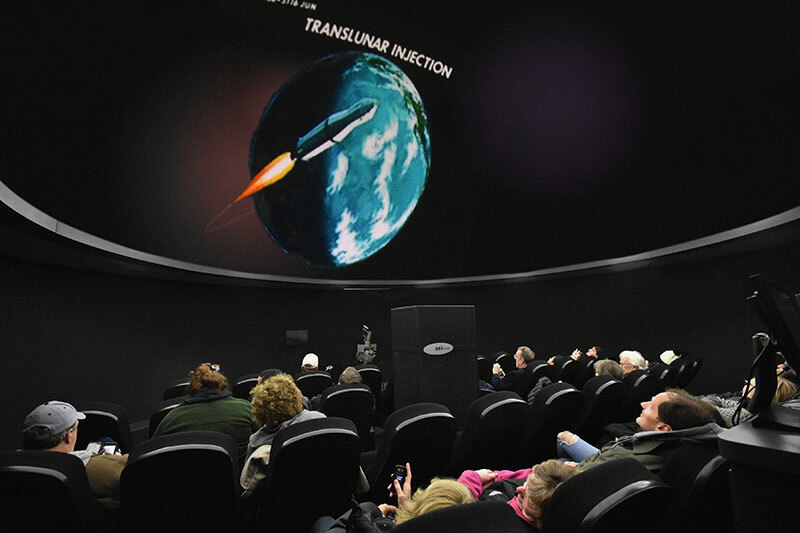 The Shineman Center planetarium audience on Nov. 25 views a historical look at the early American space program in “Around the Earth and Around the Moon,” a show by John Zielinski of the physics department. The edited photo includes one of the many period renderings used throughout the show, which helped illustrate the milestone achievements during the Gemini and Apollo space flight missions of the 1950s and ‘60s. Those pioneering flights led to the manned moon landings, the first aboard Apollo 11 in July 1969. Also included was student Paul Falice’s 2018 Quest presentation about “The Precession of the Earth,” which showed how, due to Earth’s “wobble” over the course of many thousands of years, different stars have become our North Star. The show was part of Cruisin’ the Campus for the Thanksgiving week. 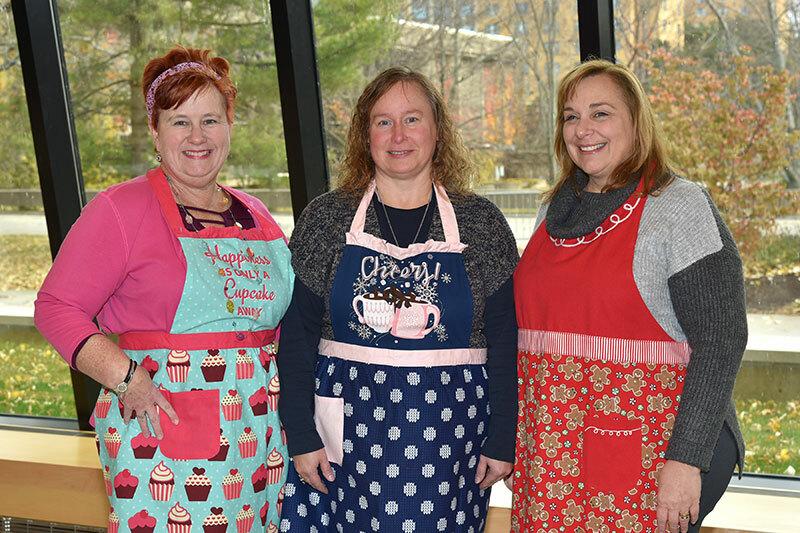 Bakers around SUNY Oswego's campus turned out for the recent 2018 State Employees Federated Appeal/United Way Bake Off, and three emerged as the top vote getters among staff, faculty and students who taste-tested the competitors' treats. From left, Terrie Pettie won the Marano Campus Center sale with her Fantasy Chocolate Carmels, Tina Radley took the title in Culkin Hall with Chocolate Fudge, and Carol Willard won in Mahar Hall with Chocolate Toffee Cookies. The Bake Off raised $531.50, part of many awareness- and fundraising events during the annual charitable campaign. For more information, visit oswego.edu/sefa. Popular upcoming SEFA opportunities as the canned food and toy drive at Laker hockey games this Friday, and Holiday Skate with the Lakers on Dec. 9. Career development coach Eric Frans (center, in back) leads students in a visit to Seaboard Graphics in Syracuse. 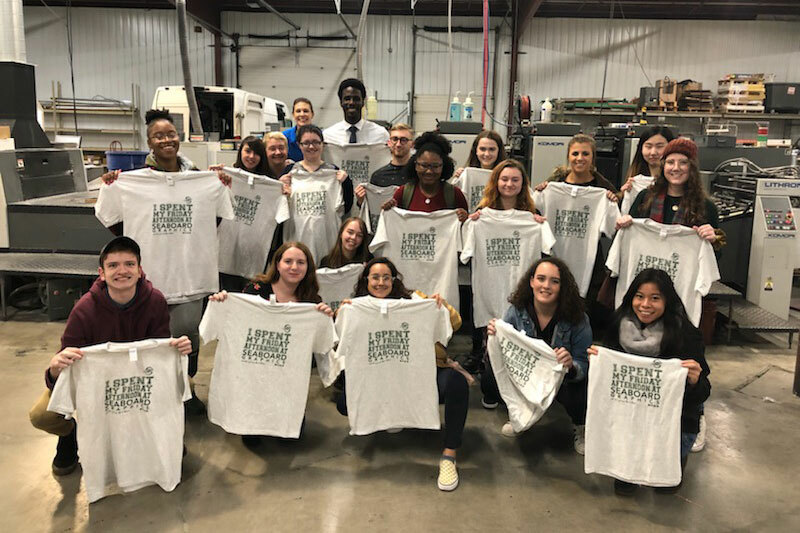 The company made the students shirts at the end of the tour. The Office of Career Services assists students in identifying their strengths, goals and potential career paths throughout their college careers. Frans is among staff members who develop expertise and contacts in industry categories -- in his case, fine and performing arts, media and entertainment. 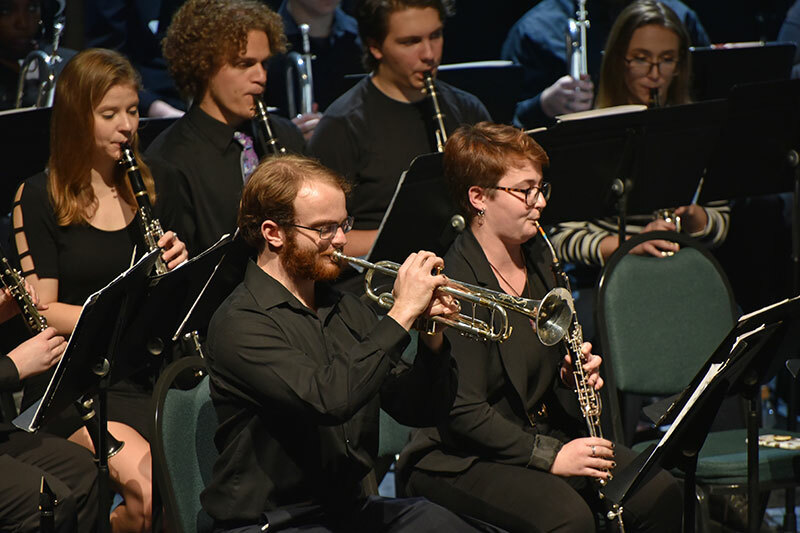 The SUNY Oswego theatre department will do a staged reading at 7:30 p.m. Thursday of famed Irish playwright George Bernard Shaw's "The Shewing-Up of Blanco Posnet: A Sermon in Crude Melodrama." 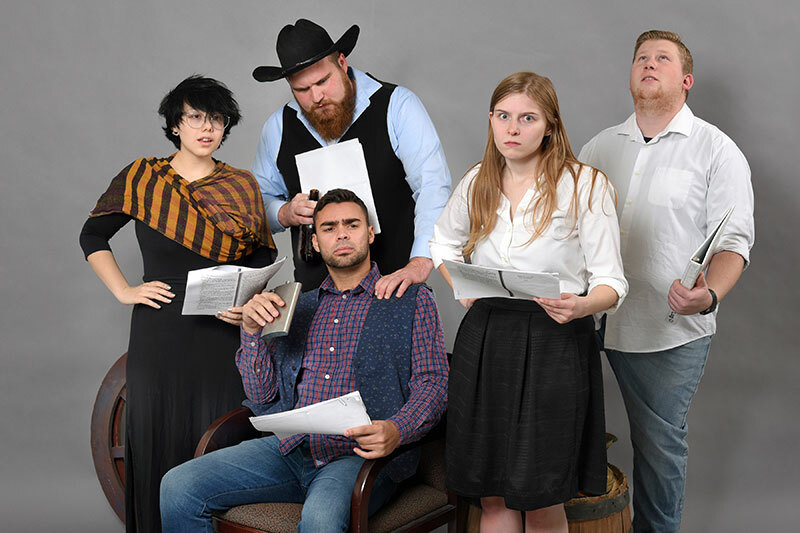 The play features Oswego students Bryce Cohen (seated) as Blanco Posnet, a cowboy accused of horse thievery and on trial for his life; and (from left) Madelyn Crews as The Woman, Douglas Woolever (Sheriff Kemp), Autumn Pollock (Feemy Evans) and William (Liam) Carr (Elder Daniels). When written in 1909, the play ran afoul of British censors over language thought to flout the blasphemy law of that era. The performance is free but ticketed; visit the college's tickets website for details. 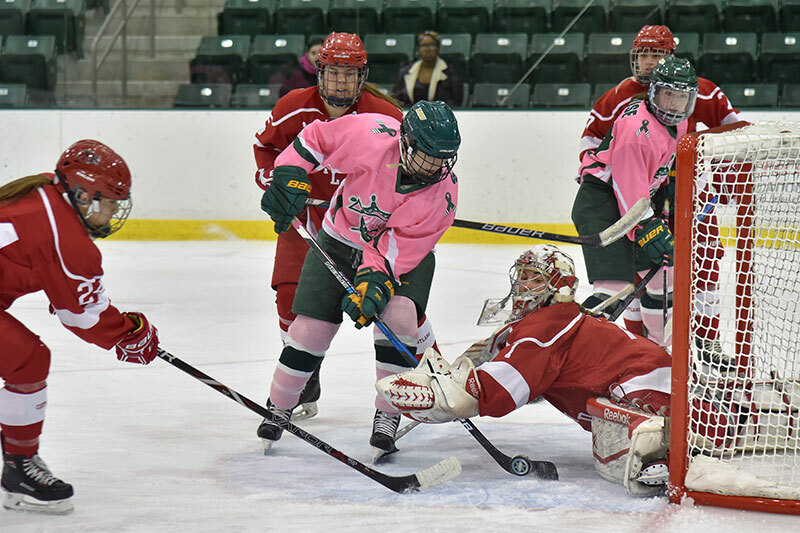 Oswego Lakers junior forward Eryn Stewart pushes the puck through Cortland’s goaltender in third period action of the Nov. 16 women’s hockey game in Marano Campus Center arena, played as the annual Pink the Rink game to benefit Colleges Against Cancer. The score remained 1-1 after a five-minute overtime period, accounting for the tie in Oswego’s 3-0-1 conference record heading into Friday’s 3 p.m. matchup with Plattsburgh, which offers attendees an opportunity to donate canned food or toys in partnership with the annual State Employees Federated Appeal. Coached by Diane Dillon -- subject of this issue’s Spotlight feature -- the team is off to a 5-0-1 start overall. 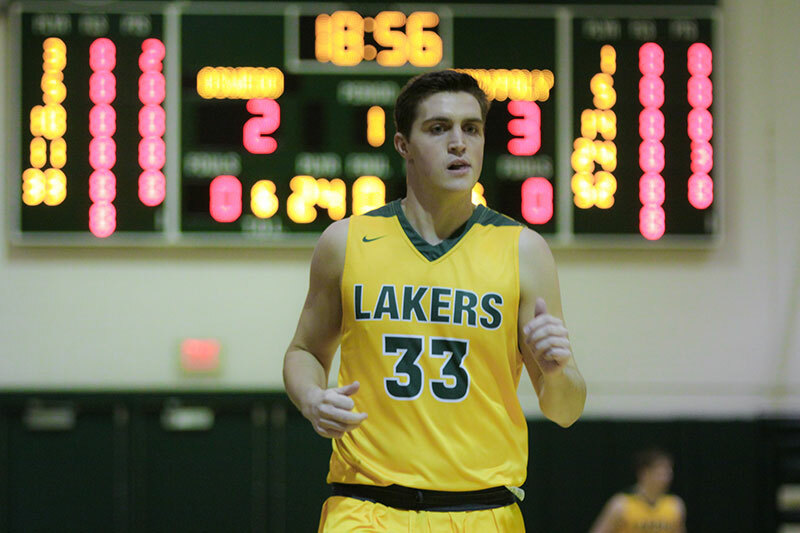 Senior transfer Quinn Carey recorded the 1,000th point of his collegiate career in the Laker men’s basketball team’s 80-60 win over Clarkson University on Nov. 20 in Max Ziel Gymnasium. He poured in 22 points on 7-of-13 shooting from long range in the non-conference game. The men’s basketball team is scheduled to open SUNY Athletic Conference play at 7:30 p.m. Friday at home against Geneseo, Carey’s former school. 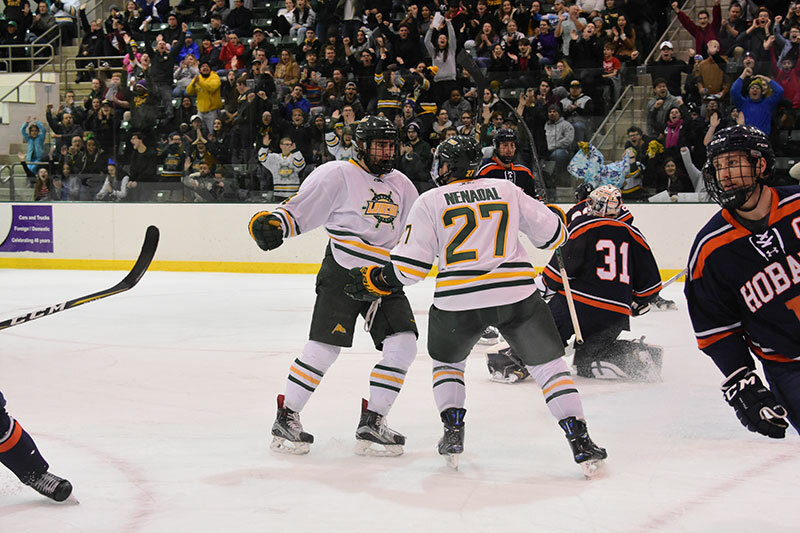 Jody Sullivan (center, left) prepares to celebrate his goal -- the first of the game -- with Josh Nenadal, who assisted on the Laker goal along with Joey Scorpio, in Oswego State’s 4-2 win over then-No. 5 Hobart in Marano Campus Center arena on Nov. 10. The Lakers, now ranked sixth nationally in Division III men’s ice hockey, never trailed in a battle of two of the nation's best teams. Oswego (4-1 overall, 2-1 in the SUNYAC) next takes the ice against Brockport in a home game at 7 p.m. Friday, featuring a Teddy Bear Toss for Oswego County Toys for Tots and a canned food/toy drive for the State Employees Federated Appeal.